1887 canvas, oil. Russian Museum, St. Petersburg. The plot of the picture was a historical event: the young Tsar Alexei Mikhailovich, according to custom, chooses his future spouse. According to custom, the bridegrooms collected the most beautiful girls from noble classes. Of them meticulously selected several pretenders, from which the king chose his future spouse. 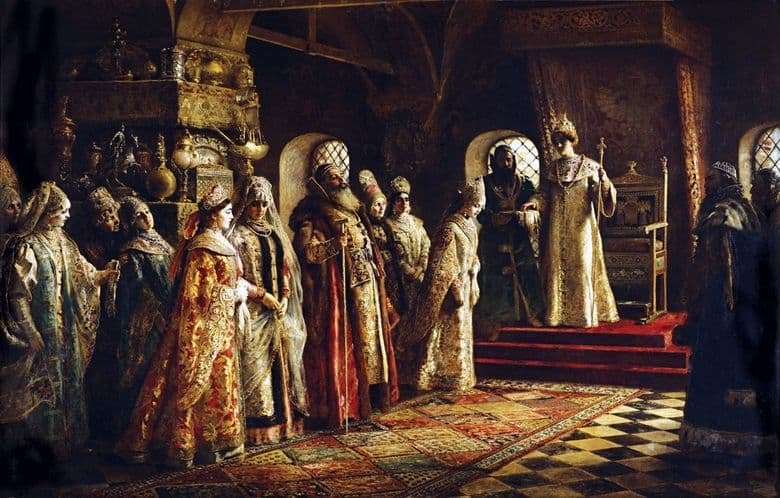 Probably, when creating a historical canvas, the painter was guided by information about the solemn event described by the historian S. Solovyov. In 1647 several young beauties were introduced to the young tsar, of whom the young Romanov singled out Euthymia Vsevolzhskaya. However, the girl did not become a queen – human envy and cunning destroyed her. Dressed in royal clothes, the beauty fainted from too long hair. The event was immediately presented as an attempt by the family to hide the fact of the girl’s illness. Fainting recognized as epilepsy and immediately sent Vsevolzhsky from the yard. The spectator finds the most exciting moment of choice – the young king already takes a ring from a small tray in order to get off to the chosen one and declare her future queen. There are many people in the wards, everyone wants to know the name of the lucky woman as soon as possible. In the right part of the picture, on the light half of the contenders are collected. The girl closest to the king shyly stopped in her bow. From the figure comes quite tangible excitement, fear, awe. The girlish figure in the richly embroidered gold thread attire is the most confident among all the women. Stately beauty. drooping down, waiting for the decision of his fate. Restrained anxiety is transmitted by hands twirling a lace handkerchief. Among the brides is an overweight, tall, handsome man. It is important to lean on a cane, he looks down on people standing opposite. The boyar is obviously of a high order and rank, close to the king, feeling calm and confident near the young king. A work of art can be called a true masterpiece of painting, so masterfully written out the smallest details of costumes, household items, a rather modest entourage of the royal chambers. The author showed himself not only an outstanding master of the brush, but also a great connoisseur of the Russian life of the past centuries.